For those of you who are not aware of “BITS” This is how it works. Imaginge that you are in a musical, people bustling about you in Rundle Mall, chatting, laughing, then something happens. Music starts, suddenly everyone seems to know the words and dance steps. People dance and sing and then, as the song ends, they disperse back into the crowd as if nothing happened. FlashMobs all over the world have been running BITS for a while now. Adelaide has had two successful ones ‘kiss the girl’ and ‘wicked’, the videos of both can be found on youtube. However we need people to learn the song, come along and learn the choerography (both relativly simple so anyone can do it.) Without people, we cannot make this happen. There will be more details on the day. Please take a look/listen to the song that we are doing. It is ‘little town’ or ‘belle’ from Beauty and the Beast, the very first song of the whole movie. 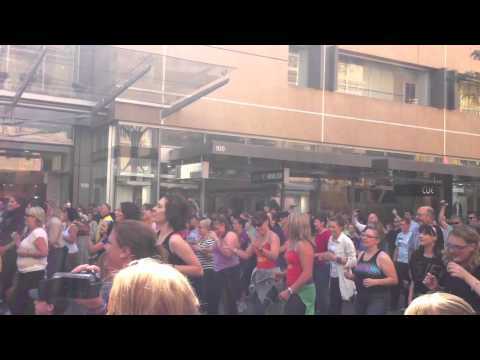 Weird World of Sports – Featuring the Adelaide Flashmob! « Adelaide, you’ve been RICKROLL’D! © 2019 Adelaide Flashmob. All Rights Reserved.